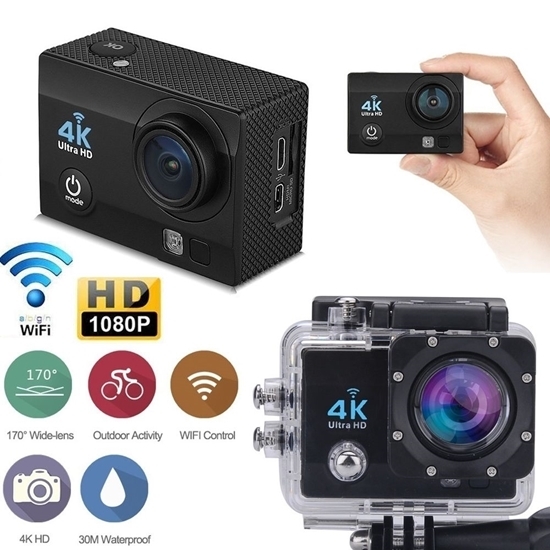 ★ 4K ULTRA HD 170°WIDE ANGLE ---170°A+ High Resolution Wide Angle Lens, Rotate Freely From 70°- 170°, Take 4k Ultra Hd Videos And 16M Photos. This Is Exactly What You Need To Capture The Happiness And Passion During Family Trips And Adventures With Friends! ★ HIGHLY WATERPROOF --- With The Complimentary Waterproof Case, You Can Film Scenes Up To 30 Meters Underwater; Bring It With You Rain Or Shine, When You’Re Swimming, Surfing, Skiing, Or Diving; Relive The Underwater Scenery, And Never Miss Filming a Remarkable Moment Because Of Water. ★ WIFI SUPPORTED --- Download The App Client (Scan The Qr Code To Install The App On Your Smartphone), Turn On The DV Wifi Function And Phone App To Connect The DV To Wifi, Search To Add The Camera By Id Code, After Which You Can Perform Camera And Video Operations From Your Phone. ★ FULL SET OF ACCESSORIES --- 900mAh Large Capacity Batterie Give You Long Battery Life; Thumb Screw Makes Assembling Easier; Waterproof Cover, Bicycle Stands, Helmet Seat*2, Data Line, Bandage, Clip, Adapter, Adapter Bracket*3, Bank Clip, Arc Clip, Fixed Seat, B Shell, Tie, 3M Glue, Charger, Wire Rope, Wiping Cloth, And Batteries Lets You Use Your Camera Under All Circumstances.